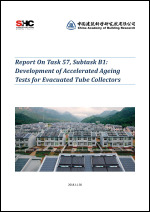 Report on experiments and test for accelerated ageing of evacuated collector. In some cases significant influence on the heat loss coefficient is seen. This standard is appropriate to the support of close-coupled type domestic solar water heating system (the tank storage capacity less than 0.6 m3) and the supports of which are made from galvanized iron sheet or aluminium alloy or/and stainless steel. The supports are processed by panel beating, surface paint-spraying and surface plastic-spraying. The testing method of the supports made from other materials or other processing of surface treatments can refer to this standard. In the Work Plan for the Task 57 of IEA/SHC, a specific activity B5 “Defining / discussing environmental extreme conditions” was presented for the Subtask B. 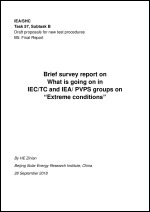 In order to make it co-ordinated with related international standards, a more concrete activity B5 “What is going on in IEC/TC and IEA/ PVPS groups on Extreme conditions” was further specified. In past years, some information about IEC/TC and IEA/ PVPS groups on Extreme conditions has been searched. 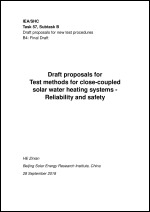 The search results are undoubtedly helpful for preparing definitions of environmental extreme conditions in solar thermal application in the future. This document specifies a procedure to verify the performance of large collector fields. The collectors in the fields can be glazed flat plate collectors, evacuated tube collectors and/or tracking, focusing collectors. 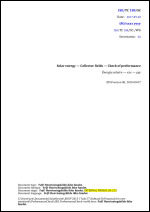 The check is done on the thermal power output of the collector field – the document specifies how to compare a measured output with a calculated one. The document applies for all sizes of collector fields. This standard specifies the terms and definitions, classifications, codes and markings, general requirements, requirements and test methods, inspection rules, signs, marking and operation instruction, packaging, transportation and storage of solar thermal components for building. 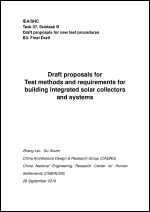 This standard is applicable to solar thermal components for industrial and civil usage. 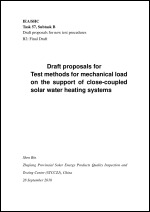 This standard specifies test methods for assessing the reliability and safety with regard to close-coupled solar water heating systems. This standard is applicable to all types of close-coupled solar water heating systems, including those using flat-plate collectors with thermo-siphon circulation; and those using evacuated tubes directly connected to the storage tank. This standard is also applicable to close-coupled solar water heating systems assisted by air-source heat-pumps; and to close-coupled solar water heating systems with auxiliary electric energy for normal system operation.